A Rita's just opened around the corner from us. For those of you not familiar with Rita's, it is frozen custard and gelato icees. The two can be mixed together and candy can be added to the concoction. My daughter has fallen in love. She begged me to take her today. My answer was no. She asked numerous times and my answer remained the same. She has been twice in the last three days. Giving her everything she wants is not being faithful to her. Parenting sometimes requires NOT giving children what they want because you know what is best for them and their bodies. The same is true for our Father. His faithful love is constant. At times, we pray and pray for things and circumstances. When we are not given what we are praying for, it can be hard to grasp. We are left to wonder if God hears our prayers. We can be sure He does. Just as we know what is best for our children, God knows what is best for us. Rest assured, He is faithful and desires to give us what is best for us. I was thinking about His faithfulness this morning as we sang in church. I was praying for a sweet friend of mine who is being hit with some hard times. My heart aches for her. I want God to take her pain and make everything ok. We were sitting in the balcony and as I looked up from my prayer I noticed an older gentleman shuffling back to his seat. He was hunched over and I quickly realized he had been kneeling at the prayer rail. At that moment, he was the only person I noticed. God spoke to me with such an audible voice I had to look around to make sure the voice didn't come from someone around me. He said, "Be that man." I knew exactly what He was telling me. When I am weak and broken I still must fall to my knees before Him. He remains faithful to me, and I must do the same towards Him. 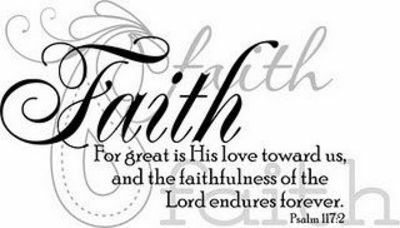 God's faithfulness requires no effort on His part. He IS love and can't help but share it with us. We must show Him our love by being consistently faithful to Him. Even when we cannot stand, we can crawl to Him with anything and everything. Turning our eyes to Him in times of brokenness is beautiful to Him and is nothing short of faithful.